Fat Quarter Shop's Jolly Jabber: New Pattern Page + PDFs! New Pattern Page + PDFs! We are excited to announce that we have a brand new patterns page! With the amount of patterns, books and magazines we carry it is long overdue if I do say so myself! We’ve tried to provide easier ways for you to find the types of patterns or specific items you may be looking for. Along the top of the page we provide easy links to the five main categories of our patterns and books – Quilt Patterns, Sewing Patterns, Books, Magazines and PDF Downloadable Patterns. The second section lists all our top selling patterns and books along with some of our most popular pattern categories. Have you purchased one of our new Downloadable PDF Patterns? 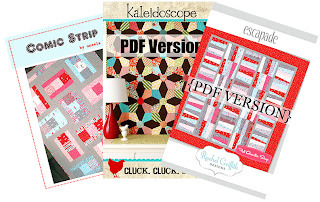 These are perfect for when you want to sew “right now!” When you purchase a PDF pattern the file will email to you within minutes and you can start sewing immediately. Please let us know your thoughts on our new patterns page (yes, the good and the bad)!! Thank you.